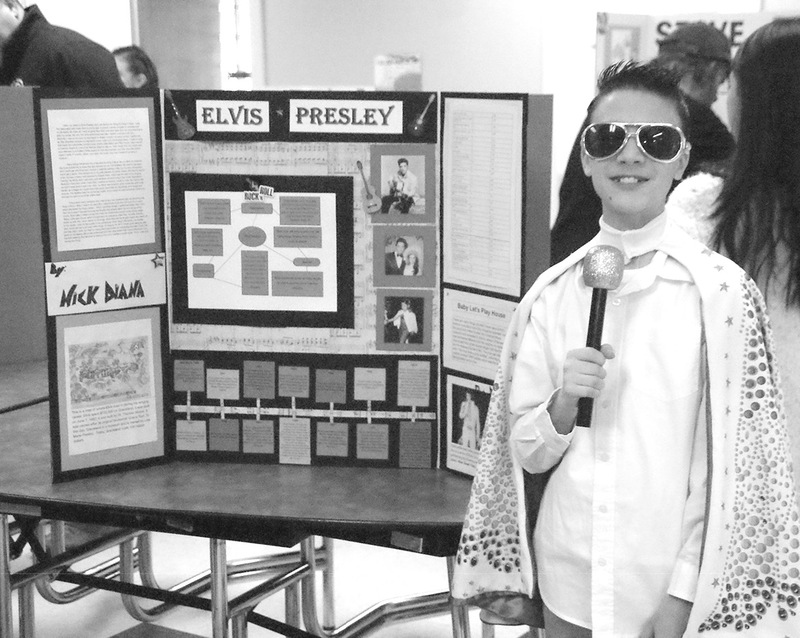 Elvis Presley, impersonated by Nick Diana of the sixth grade in Suffield Middle School’s Wax Museum, explains how he got to be a top star in American popular culture. The Suffield Middle School’s yearly Wax Museum is a two–morning program that’s been one of this reporter’s favorite assignments. All the sixth graders are asked to choose and learn about a prominent non–fiction figure from a biography and other sources. Then they prepare a tri–fold display panel telling about that individual and write a short presentation, which they deliver, costumed appropriately and speaking as the person they have studied. The presentations are customarily given in the school gymnasium, but the event was moved to the cafeteria this year because the gym was set up for a gymnastics event. During first period on February 27, the Blue Team made their presentations to visiting parents and others; in second period, the White Team students came in with clipboards and rating sheets to hear and evaluate their peers’ performances, a feature of the program that adds another bit of learning. On the next day, the Blue Team evaluates the White Team’s performances. Among the Blue Team’s chosen figures were Michael Jackson, George Washington, Elvis Presley, Melinda Gates, Jeff Bezos, Gen. George Patton, Pelé, Mario Lemieux, Amelia Earhart, Beyoncé, Helen Keller, Rosa Parks, Donald Trump, and many more, with some famous folks represented more than once. The choices were probably affected by the availability of “young adult” biographies, but it was evident that the research often went well beyond that source. The Wax Museum seems like a well-designed scheme with diverse learning opportunities, as well as an often-enjoyable activity for the students.